The Ride with the trend EA strictly follows a trend and performs its built-in algorithms. The robot has numeral settings and Martingale which allows the EA to turn series of loss-making trades into profitable ones. The robot can work on all timeframes and currency pairs, but the best results can be achieved on H1 or higher! Test the robot in the strategy tester on various currency pairs and with different settings to find the best parameters. If you are absolutely satisfied with the trading strategy of the robot, you may buy it! Happy Trading. Attention! The EA price may rise! Auto_lot - if you set any value here, the initial lot will be set automatically. The higher is the value, the higher is the risk. Martingale - multiplier for the next lot in case of an unprofitable position. TakeProfit - take profit. If set to 0, take profit is not placed. StopLoss - stop loss. If set to 0, stop loss is not placed. TrailingStop - trailing stop. 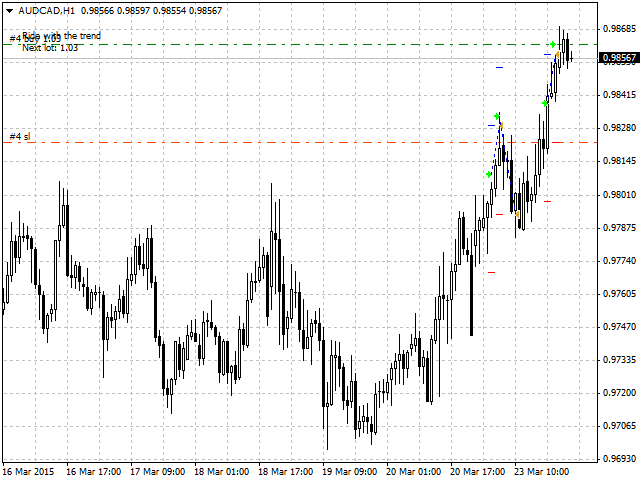 Number of points in the profitable direction from the price to enable trailing stop. If set to 0, trailing stop is disabled. 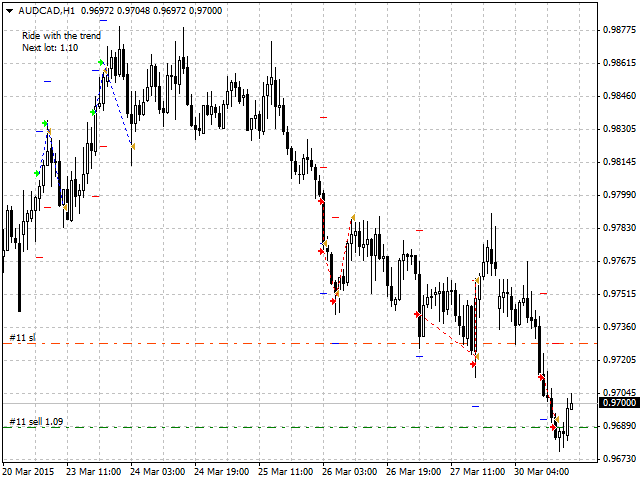 TrailingStep - step from the current price for moving stop loss if trailing stop is enabled. BY - breakeven. Disabled if set to 0. If you set any value here, breakeven will trigger when this number of points will be passed from the current price. by - number of points to protect. Trend power - power of trend. The higher is the value, the bigger trend will be chosen by the EA for trading. The best value is 60-100. Time settings - settings of trading time. You can set a day and time of trading (hour and minutes when the EA enables and disables). Magic number - magic number for multiple trading. Color_buy - color of buy orders. Color_sell - color of sell orders.